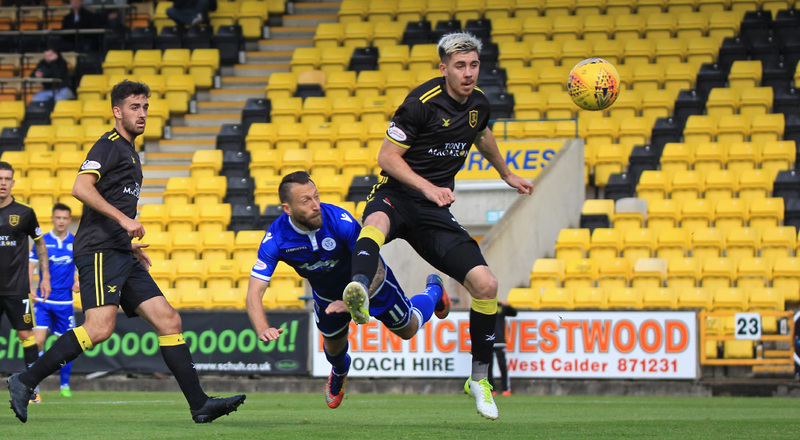 It was an afternoon belonging to the substitutes as Queens left Livingston with a share of the spoils in an entertaining encounter. The hosts took the lead through a penalty kick in the first half but two superb goals from subs Andy Stirling and Derek Lyle looked to give Queens all three points but fellow sub Dylan Mackin bundled home a tap-in to earn his side a point. The Doonhamers made three changes from the side who beat Berwick Rangers 5-0 last week. Returning to the side were Jason Kerr, after international duty, Chris Kane and Kyle Jacobs. Derek Lyle, Andy Stirling and Shaun Rooney dropped to the bench and were joined alongside newest signing James McFadden. Jack Leighfield retained the number one jersey as Alan Martin recovered from the flu but was named on the bench. 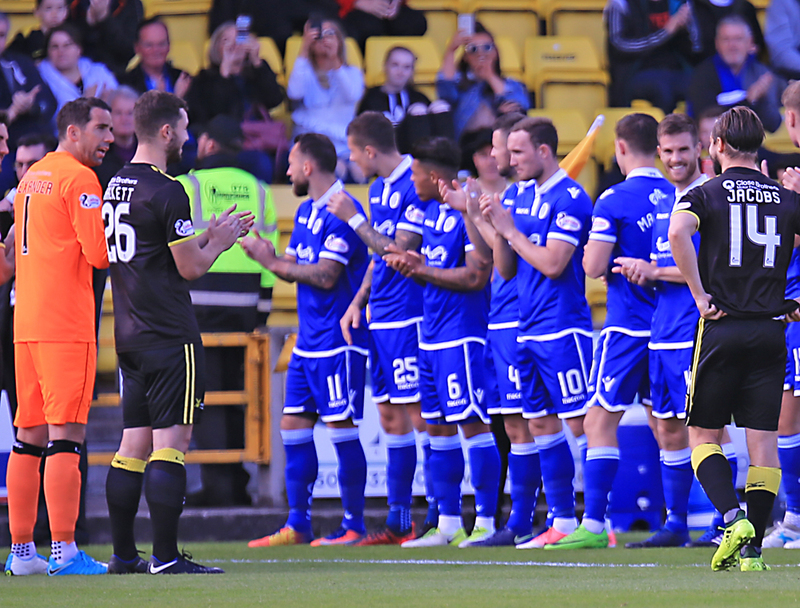 Prior to kick-off there was a guard of honour for Keaghan Jacobs, who broke Livingston?s all-time appearance record last week. It was also the midfielder?s 28th birthday and he was coming up against his younger brother Kyle for the first time in his career. It was an even start to proceedings but the visitors had the first attempt at goal on 2 minutes when Jordan Marshall`s floated delivery was headed by Kerr but he couldn`t repeat the outcome from his last Queens performance as his effort was comfortably caught by Neil Alexander. 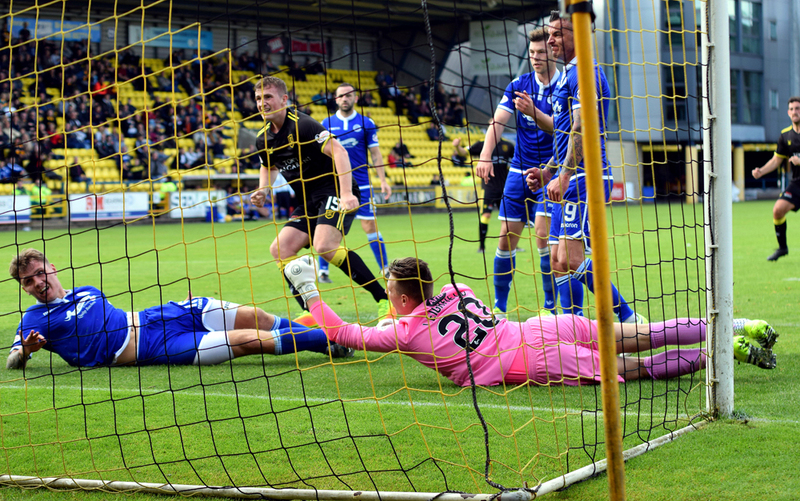 Striker Stephen Dobbie could only head wide under pressure before Jacobs was on hand to clear the danger after a quick counter-attack by Queens. The Doonhamers probably just shaded the opening 15 minutes and after a mistake from Livi`s Jacobs was intercepted by Kane he broke forward, eyed a pass to Lyndon Dykes on the right. The Austrialian saw Queens bodies proceeding to the box but his cross was knocked out for a corner. 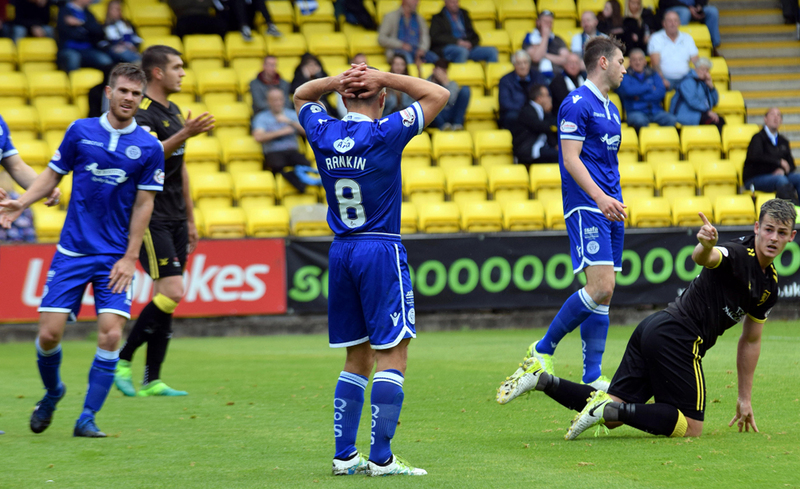 The nice weather at Almondvale soon turned to rain and Queens suddenly had to weather a Livingston storm too. Young goalkeeper Leighfield made a superb save with his feet to deny Nikolay Todorov from eight yards. Unusually sub goalkeeper Alan Martin took a seat in the stand, whilst striped for the match.The youngster made another good save moments later as Danny Mullen`s shot was palmed wide. Queens looked second best and losing every second ball but the hosts couldn`t manage to get the breakthrough. 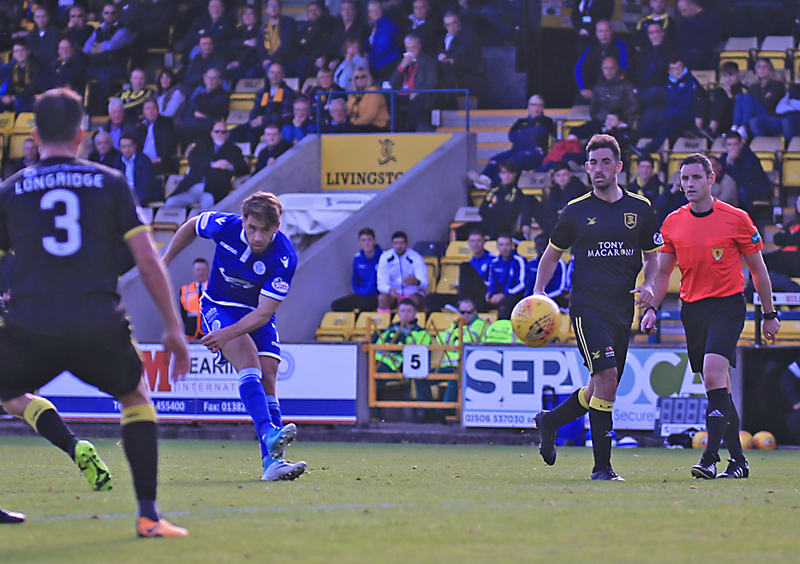 Queens had a rare opportunity to score when Dobbie`s free-kick from 20-yard outsmarted Alexander but narrowly missed and hit the side netting. 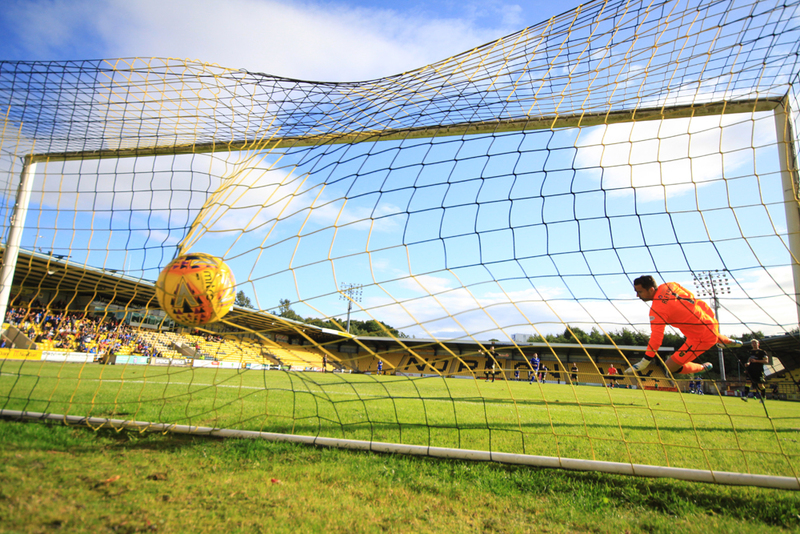 From the next attack Livi had a superb chance to take the lead when John Rankin caught the legs of Mullen leaving referee Steven McLean no option but to point to the spot. Josh Mullin stepped up and made no mistake and buried an unstoppable penalty past Leighfield, even though he guessed the right way. The penalty was the last meaningful action of the first forty-five and manager Gary Naysmith wouldn`t have many a kind word to say in the dressing room at half-time. Both sides came out and the sunshine returned but there were very little chances for both sides with the home side still edging the proceedings. The Queens gaffer waited until the hour mark to make a triple substitution. Lyle, McFadden and Stirling all came on for Rankin, Dykes and Kane. And Naysmith`s gamble paid off ten minutes later in a spectacular fashion. The ball was sprayed to Stirling and he unleashed a simply magnificent 25-yard strike past Alexander. 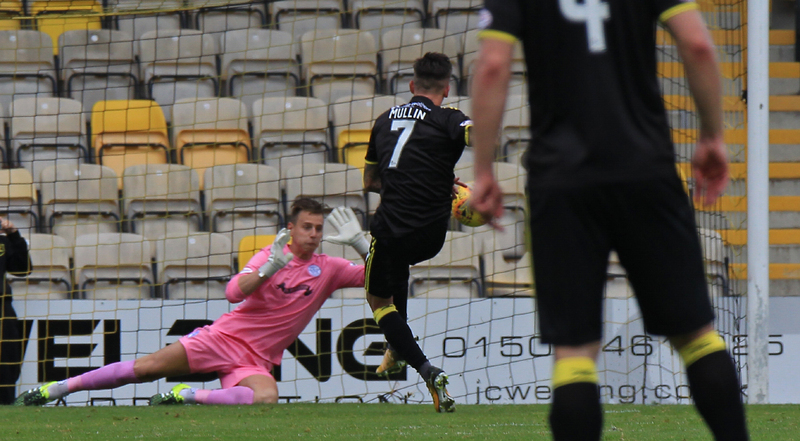 A goal that could be an early goal of the season contender, alongside Dobbie`s fine finish against Falkirk. The pendulum had swung back into the favour of the visitors and even the sunshine assisted to help Queens take the lead on 77 minutes. A long ball wasn`t cleared by Declan Gallagher, who was blinded by the sun, and Lyle pounced on the mistake and chipped over Alexander and into the net. 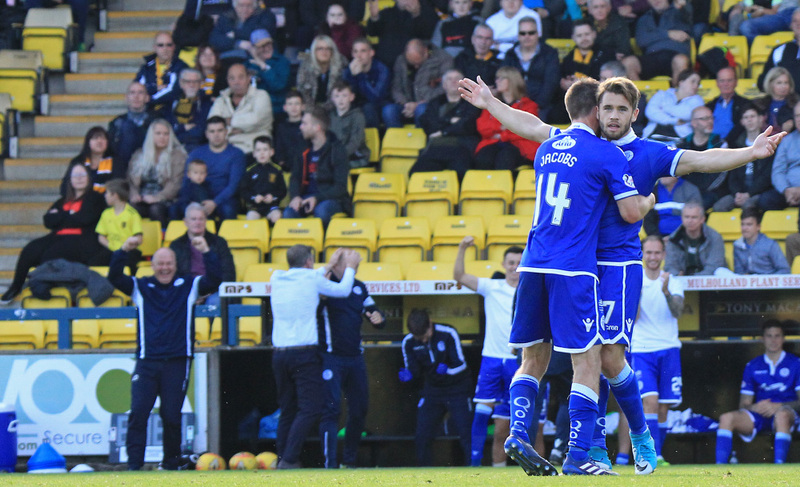 The goal means the Tan Man is now Queens` joint third all-time goalscorer and now has sights on to become the second highest goalscorer in Queens history. The hosts however got back into the match through their own substitute Mackin with nine minutes to go. After abit of pin ball in the Queens box the ball fell to Alan Lithgow and he passed the ball across the face of goal for the striker to tap home and earn David Hopkin`s side a share of the spoils. FULL TIME LIVI 2-2 QOS. Queens will be back at Palmerston for the first time in a number of weeks when they host Greenock Morton on Saturday. 14:47 Three changes for the Doonhamers. Kerr, Jacobs and Kane in for Rooney, Stirling and Lyle. 2 min Free-kick to Queens as Dykes is fouled by Shaun Bryne. 2 min Marshall`s delivery finds Kerr but his header is caught by Alexander. 7 min Jacobs floats a cross in that is nodded on by Kane into the path of Dobbie but his header sails wide. 8 min Fordyce`s cross is headed out for a corner. 18 min Leighfield makes a superb save with his feet to deny Todorov. 21 min Mullen`s shot is palmed wide by Leighfield. 27 min Fordyce`s cross is caught by Alexander. 37 min Bryne fouls Kane and Queens have a free-kick in a dangerous position. 38 min Dobbie see`s Alexander on the other side of the goal but his free-kick hits the side netting. 39 min Penalty to Livingston. Rankin brings down Mullen. 40 min Mullin gives Leighfield no chance with the penalty, even though the youngster guessed correctly. 41 min Jacobs booked for a foul on Dykes. 45 min Leighfield saves Todorov header. 53 min Todorov`s low powerful free-kick is well held by Leighfield. 59 min Another good save by Leighfield as Queens look to make a triple sub. 68 min Bryne booked for dragging Kerr to the ground. 69 min Jacobs` effort flies wide. 71 min Stirling hits a superb strike from 25-yards out giving Alexander no chance. Here we go. 73 min The yellow card has been coming for Mullen all afternoon. Needs to knuckle down. 77 min Lyle beats the defenders and dinks the ball over Alexander. 82 min Mackin taps home to make it level again. 90+1 min Late free-kick for Queens. 90+2 min Free-kick comes to nothing.